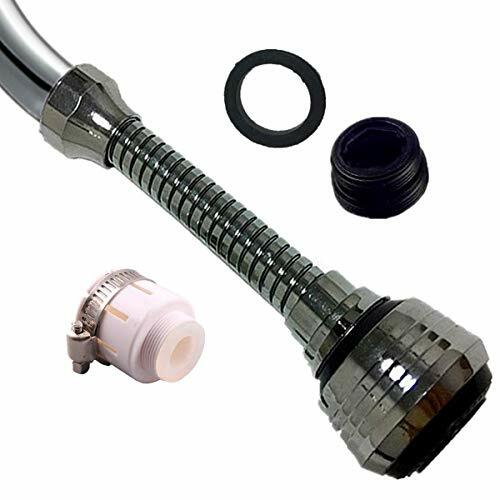 ※360 Degree Full Rotating：The hose of goose neck faucet sprayer turn it or adjustable in whatever direction or angle you want, making it easy to clean over sized supplies in sink or such as big plates or pan etc. ※Easy Assembly：ABS body of faucet aerator construction assurance quality and longevity, pull transfer switch diverter valve provides smooth two method spout water，easy to assembly for faucet, Fit faucet spout size : d=4/5\",1\",1/2\" to 4/5\"
※Polished Chrome :The coating surface as a mirror effect to easy clean, increased surface gloss texture, don\'t fade, to scratches; Top quality chrome finishes resist corrosion and tarnishing. ※Cold Water Supply：Smooth operation and convenient down flow. The flow Control Setting provides 2 Patterns pull switch for comb Sprayer and columnar spout. ※100% Refund： The kitchen sink aerator had test for the air and water leaking pressure during manufacturing process. it\'s standard that there will maybe some water remain in the Sprayer when you receive it. If have any question, please contact us, we can provide the best service for you.